Each month Celia from Fig Jam And Lime Cordial hosts bloggers who share their in my kitchen posts. Usually I manage to read each and every single one of them but in September I was too busy scheduling my blog posts for while we were in France, and in October I have been busy catching up on the bloggers who I read on a regular basis. Hopefully this month I will be able to peek into a lot more kitchens! Thank you if you are here taking a look into my kitchen in November 2014! My mom sent me a birthday present just before we flew overseas. I have paged through and drooled over many of the recipes and have put it aside to work through in December. Next month we will be on leave and I plan on getting through my do to list then. When we are in France we always buy duck liver pâté. Please do not read fois gras and be offended. This is not liver from force fed ducks. My blog ethos is about sustainability, and just like we eat chicken livers, we also eat duck livers. This pâté is amazing and perfect for a lunch time treat. 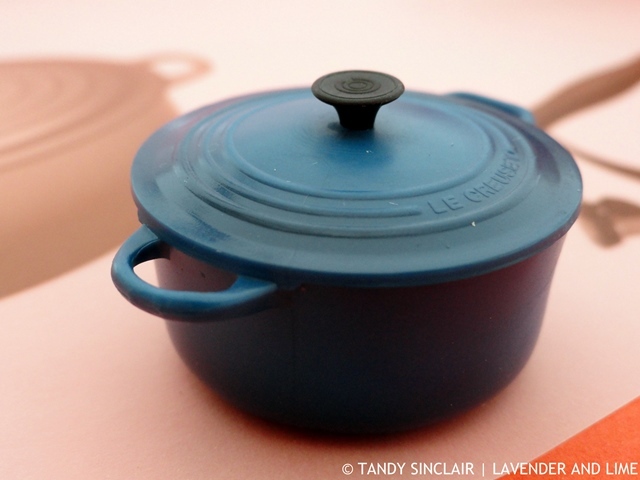 Last month I hosted a give away on behalf of Le Creuset for CANSA. Part of the lovely gifts I received included this fridge magnet. 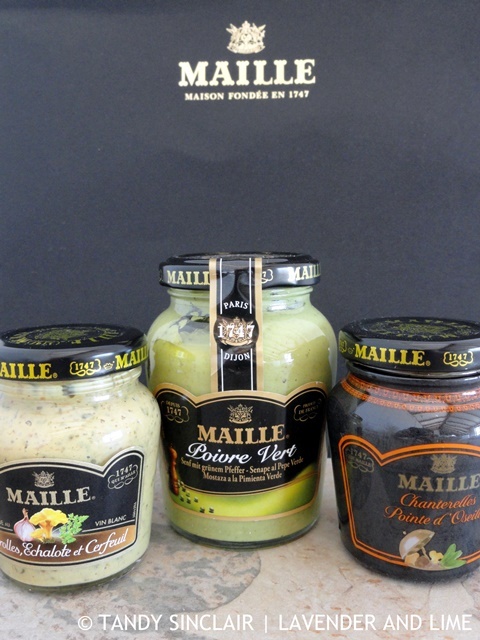 In Paris we went to a visit to the Maille boutique store. I am in love with mustard and all the flavours we saw and we came home with only 3 bottles. I am so going back next year for some other flavours. 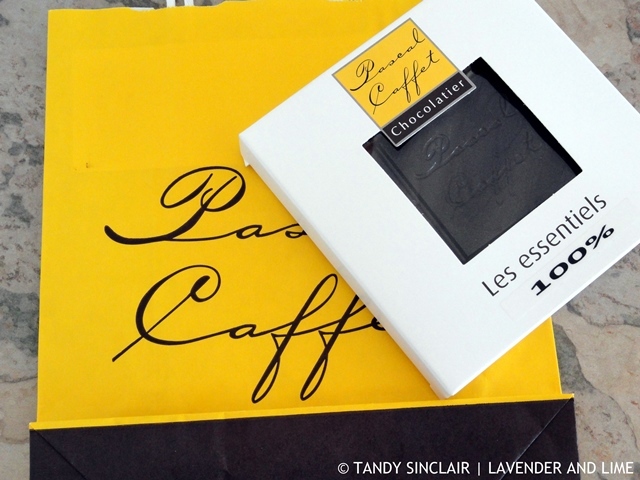 When we were in Nevers we went into a chocolatier and Dave bought himself a pastry which was beautifully packaged in a box. I chose some 100% chocolate which I shall use to make chocolates when next I have time. There is a new product on the market called gooi & enjoy. For those of you who do not speak Afrikaans, gooi translates to throw. It is a set of meal dice to use as inspiration for cooking. I will be reviewing the dice soon, but in the meantime I am showing off the wooden spoon that was made for me. I also received a fantastic spoon holder which is so useful. It fits perfectly onto my butcher’s block and does not slip and slide away. I love that it is flat and easy to clean and the saying on it – just perfect! We visited Sancerre while we were on the barge and the visit necessitated 2 taxi trips. While Dave was waiting for the taxi to bring me, he went into the tourism office. Together with a map of the village, he bought this wine opener. I will use it and remember what was our great last morning on the barge and our visit to the amazing museum in Sancerre. What a wonderful kitchen you have this month… I have been very busy in my kitchen too so I am only now catching up on the rest of the IMK posts…you are a woman after my own heart… Mustard, duck liver and chocolate… The only thing that could make that better would be truffles 🙂 thanks for sharing! Liz x PS that spoon and spoon holder are wonderful! Sounds like you sure got a few goodies in France. Hope you enjoyed the trip. That owl spoon holder is the cutest!!!!! Hi Tandy, a great collection in your kitchen this month. I’m with you on the foi gras, love liver but not into cruelty. How awesome to have a spoon with your name on it! Hi Tandy! Looks like you had quite the adventure in France! The spoon rest is very cute, and the personalized spoon lovely. Thanks for sharing. What a divine and tasty IMK, Tandy. Wow, so many beautiful things to taste and use, I’m very envious. I love your tins of pâté, they look so very decadent, what a treat. Lovely to visit you in your kitchen this month. 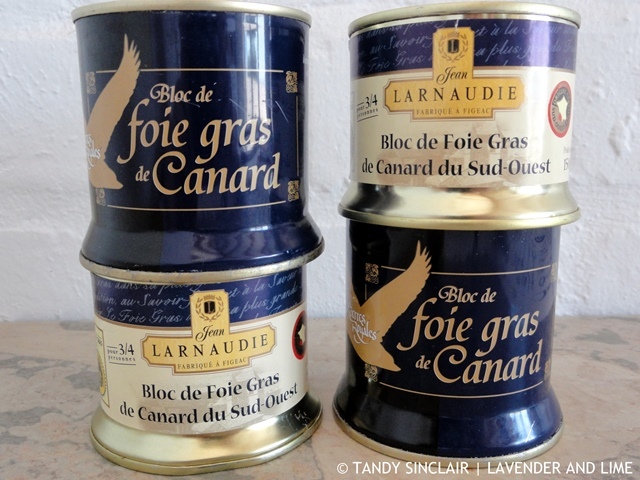 Thanks Fran, the fois gras is a real treat! i love that wooden spoon and spoon holder tandy. isn’t it fun to make your own flavoured liqueur? I do it every xmas. and we love mustard in this house so i always make big batches of it several times a year. have fun with the book. Droolworthy things in your kitchen this month! I love your collection Tandy. My favorite definitely has to be your spoon holder. Its just so cute. It works like a treat! Looks like you bought some great stuff Tandy. Hope you had a lovely holiday. It is so hard to find a waieters friend these days with all those screw cap wines on the market. Thats the cutest spoon rest. What a lot of yumminess that you brought home with you. 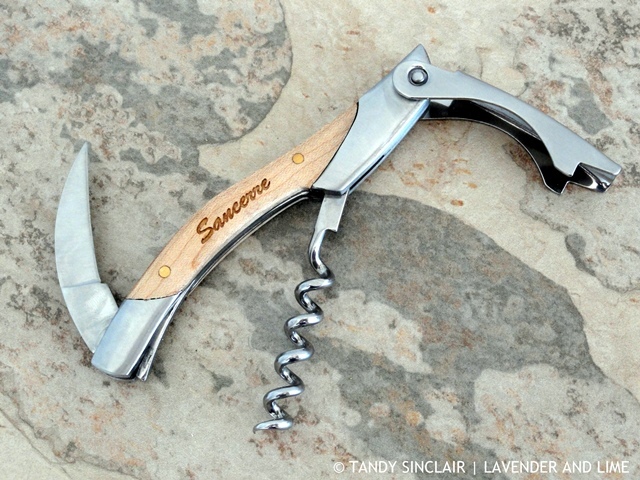 I love the cute spoon holder and Sancerre is my favourite wine so the bottle opener is a good one too. Looking forward to seeing what treats you make from the cook book. Thanks for the peek into your kitchen. I wish it were a working pot Kari! G’day! What a great post Tandy! One I enjoyed today! Loved your personalized spoon! Thanks for this month’s kitchen view also! Love the story that goes with each item! That personalised wooden spoon is pretty cute! Same with the fridge magnet!!! 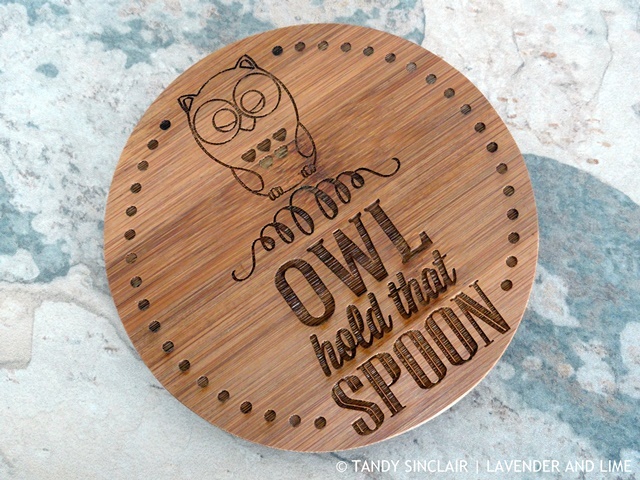 Some lovely things in your kitchen, Tandy… I love that wooden spoon! And the chocolate pastry! 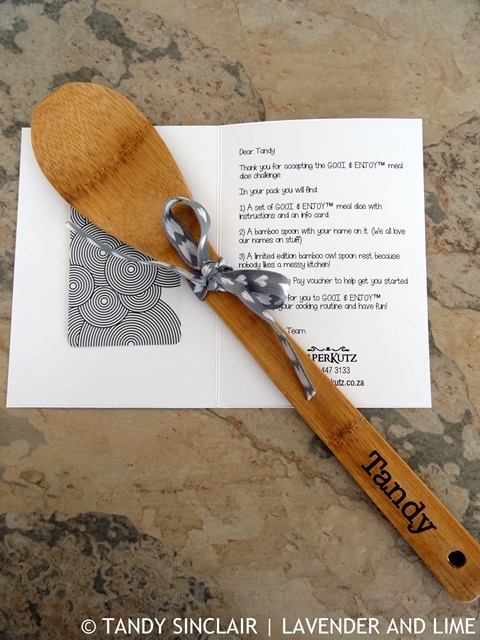 Hi Tandy, what great things you have in your kitchen this month from your travels and birthday gift! I can see you had a great time shopping on holiday – Tandy! The spoon holder is fantastic! 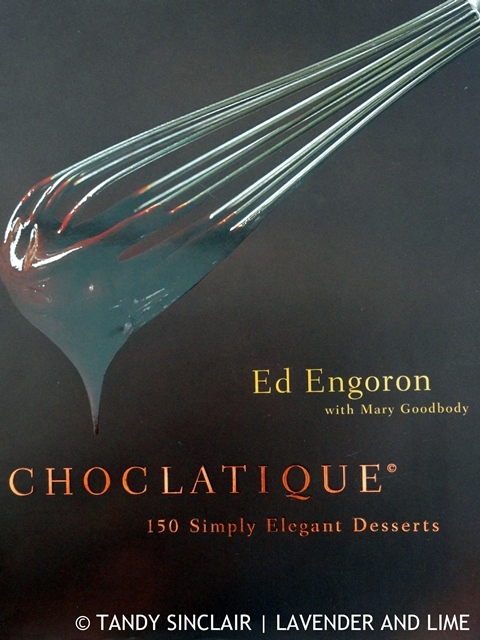 Visiting a chocolatier sounds absolutely fabulous! I would just love to have shared that experience, but that is what good travel is all about – wonderful experiences. So jealous of your purchase. Looking forward to you maybe doing a post on what you made from that chocolate bit! If my chocolate works out I will definitely do a post! There’s so much deliciousness from France in your kitchen!! I cannot wait to tuck in! You always have lovely things to share Tandy. I love your birthday present from your mom.